The episode ‘Black-tress of a Certain Age’ airs Saturday, April 16, 2016 and includes an appearance by guest celebrity Vanessa Bell Calloway. Tune in on OWNtv at 6 PST/9 EST. “For Peete’s Sake” follows the lives of husband and wife duo Holly Robinson Peete and Rodney Peete as they juggle complicated career choices with their bustling family life. Vanessa Bell Calloway is an unlikely amalgam of God-given gorgeousness, dramatic chops and unbeatable comic timing. In her turns as Lady Ella on Bounce TV’s “Saints and Sinners” and as Carol Fisher on Showtime’s oh-so-aptly named comedy-drama “Shameless,” she displays her copious talent, wasting no opportunity and leaving no stone unturned in her acting arsenal as she takes viewers along for whatever ride her character is currently on. She makes you love, hate, laugh at and laugh with her characters. There are plenty of actresses who can do either drama or comedy very well. Calloway proves again and again she is master of both in equal measure. 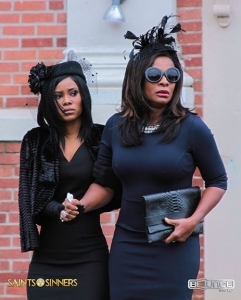 In “Saints and Sinners” she plays Lady Ella, who slays sartorially as well as politically. A sort of Lady Macbeth behind the pulpit, she doesn’t merely desire to be the power behind the pulpit, she wants her very own pulpit—or podium, to be more exact. Lady Ella has her expertly made-up eyes on public office and will do whatever it takes to get there. Saints & Sinners Breaks Records: Catch Up Online or With the BounceTV App! 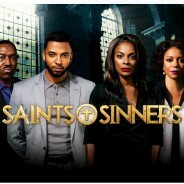 BounceTV’s Saints & Sinners drew 1.3 million viewers last week. 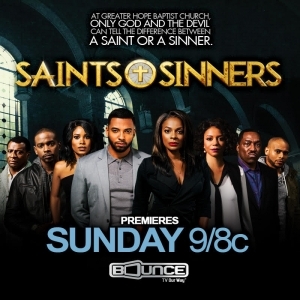 Now you can catch up- watch previous episodes online at www.bouncetv.com/shows/saints-and-sinners or with the new BounceTV app! Don’t miss new episodes on BounceTV, Sundays at 9/8C. Click here to find a station in your area. Watch the full episode of TV One’s “Unsung Hollywood” featuring Vanessa Bell Calloway! Watch the never before seen Vanessa Bell Calloway! The actress who did it all, and didn’t see the biggest obstacle in her life coming until it was almost too late. Unsung Hollywood, TV One, March 16, 2016. Bounce TV said the second episode of its original scripted drama Saints & Sinners drew 15% more viewers than the series premiere, bucking the usual pattern for new shows. Saints & Sinners got an unusual promotional push from the stations that carry Bounce TV on secondary digital broadcast channels. Many of those affiliates in major markets aired the series premiere on their main channels. Those broadcasts carried announcements telling viewers where to find Bounce TV and subsequent episodes. The show’s second episode drew 1.5 million unduplicated viewers over two airing Sunday night, the network said, citing Nielsen data. At 9 p m. ET, the show was up nearly 10% in total viewers. On Sunday night Bounce TV ranked ahead of all but three ad supported cable networks in delivery of its target market of African Americans. It trailed AMC, which aired The Walking Dead, Bravo with Real Housewives, and CNN, which carried a presidential debate. It At 8:55 p.m. on March 20, Bounce TV will air a premiere of the music video of the show’s theme song Sinners (Saved By Grace) performed by Gospel phenom Deitrick Haddon and Big Boi from the -popular hip hop duo Outkast. The song is featured on the forthcoming Saints & Sinners: Original Soundtrack From Season 1 out March 25 via all digital retailers. Haddon guest stars in a new episode of Saints & Sinners airing at 9:00 p.m. ET. Saints & Sinners is set in a large church in Georgia where a lot more than praying seems to be going on. It stars Vanessa Bell Calloway, Christian Keyes, Keith Robinson, Clifton Powell, J.D. Williams and Gloria Reuben. It’s been called the “Empire” of the church. Critics love it, and fans are raving about this steamy and provocative series, set in a big Baptist church in a small Georgia town. Airs on BounceTV on Sundays, 9/8C. Eight time NAACP Award nominee Vanessa Bell Calloway burst on the scene in All My Children and in 1988 she received rave reviews as Eddie Murphy’s arranged bride in Coming to America (“Bark like a dog!”). Since then she has put together an extraordinary body of work in films like What’s Love Got To Do With It, Biker Boys, Daylight and The Inkwell. She’s been featured in tv roles on Equal Justice, Hawthorne and Under One Roof, the first primetime drama with African American leads, and Shameless just to name a few. In this episode Vanessa gets real about her personal life, her career and the obstacles she has faced as an African American actress in Hollywood. Her supporting cast includes Star Jones, Anna Maria Horsford, Lela Rochon Fuqua, Joe Morton, and good friend Debbie Allen. By Jon Lafayette, Broadcastingcable.com, March 9, 2016. Bounce TV said the premiere of its first original scripted drama, Saints & Sinners, became the network’s most-watched program, delivering 1.3 million viewers over two runs Sunday night. The show expects to rack up more sampling this week because Bounce, which airs on secondary digital channels of local stations, has made the show available to its affiliates for airing on their main channel. Bounce says 33 stations—in markets including Chicago, Washington, D.C., Atlanta, Detroit, Cleveland, Baltimore and Memphis—plan to air the episodes, most in primetime, prime access or early fringe, beginning Wednesday. Bounce says that when Saints & Sinners aired at 9 p.m. on Sunday, it delivered 483,000 households, most for any program to date since the network launched more than four years ago. The show was re-run at midnight. “This is a watershed moment for Bounce TV. Having a huge, record-setting audience tune-in for the debut of an original series and the show becoming part of the national conversation socially, with #SaintsAndSinners trending alongside The Walking Dead,Downton Abbey and the Democratic Presidential Debate, is a tremendous achievement,” said Jonathan Katz, CEO of Bounce TV. Bounce says the show was watched by more African Americans than all but two shows on ad-supported cable: AMC’s The Walking Dead and Bravo’s Real Housewives. It topped BET and TV One by healthy margins, according to Bounce based on Nielsen numbers. The show also popped on social media with #SaintsAndSinners trending nationally on Twitter and Facebook during the premiere. Bounce will re-run Saints & Sinners on Friday at 9 p.m. and Sunday at noon. Episode 2 premieres March 13 at 9 p.m. ET.